Even with the fan outcry, who would have thought we would actually be seeing this game overseas? Most fans probably thought there was not a chance. 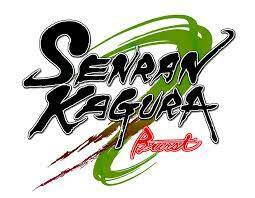 So, when XSEED Games announced that they would indeed localize Senran Kagura Burst, even with their track record, I was honestly surprised. The game is finally out and in our hands, and fans can now experience it for themselves, and discover if it offers anything more than just fan service- the very element that had many questioning whether it would be held back from localization. With two games in one, is the title worth checking out? 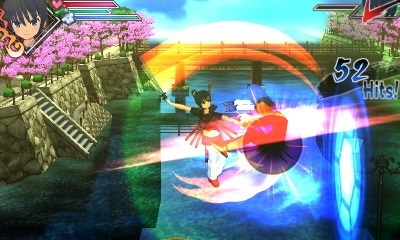 The game is packaged with two games, the original game, entitled Skirting Shadows, and the sequel, Crimson Girls, under the title Senran Kagura Burst. It follows the story of five school girls that attend Hanzō Academy and five other girls from Hebijo Clandestine Girls’ Academy. The Hanzo girls; Asuka, Ikaruga, Katsuragi, Yagyuu and Hibari, while learning to be shinobi, take on missions to further their skills while trying to live a school life. That life quickly turns upside-down when the rival school, Hebijo, comes to steal Hanzō’s super-secret nipon scroll, and the clash between good and evil begins. For the Hebiko girls; Homura, Yomi, Hikage, Mirai and Haruka, the plot is more or less the same, but, instead of it just being from their perspective, it instead provides an alternate take on the original story, though it ends more or less the same way. Both have a hub room to take on various missions or talk with each character to learn more about the current events in the world of Senran Kagura, with new dialogue as the story progresses. For a game that was judged at face value frequently, many would probably doubt this game would even have a story, let alone characters with depth, but it’s quite the opposite. While the plot for both stories is very simplistic, the girls are genuinely interesting, and can keep you engaged throughout the five chapters of both routes. All the playable characters, and even side characters, have a lot more depth than the typical beat ’em up game, even somewhat comparable to an RPG. All have their own backstories and plot progression. 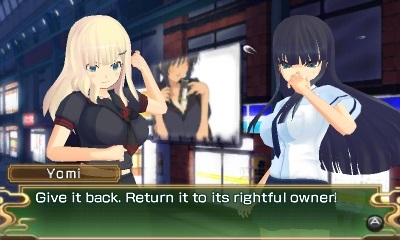 The game progresses through a visual novel text-style with some CG, or through exposition between one or more characters with 3D models with in-game cutscenes. Each character grows as the story develops. Even with them being the typical archetypes seen in anime and manga stories, you will grow to love each and every one of them. Each character has reasons for wanting to be a shinobi, and struggles with the looming question of the moral of the story; black and white morality, the difference between good and evil and why they have to fight each other. If you’re one of those who needs a story, even with a side scrolling beat ’em up game with a likable cast, you will feel right at home. 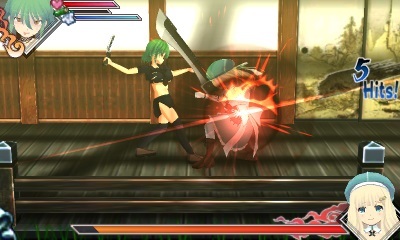 Gameplay, however, is where Senran Kagura Burst faces its biggest hurdles. All characters have their basic combos at first, but, as they level up with the lite-RPG mechanic, not only do their individual stats increase, but so does their move pool, similar to Koei Warrior games. You have your weaker, but faster moves with the Y button, with the X button for the slower, stronger attacks. Combining both gives you a string of combos to lay waste with the dozens of enemies the games throws at you. The B button is for jumping, allowing for air combat or slamming into the ground. Lastly, with the A button, you can dash, and, when held down, you can sprint. It doesn’t end there. When you finish a combo on an enemy, when prompted with a green circle popping up, pushing the A button allows you to use an Aerial Rave to continue striking the enemy in the air. Finally, with the R button, at the cost of some health, you will use a Limit Break, which knocks back enemies. What sets the game apart from other beat ’em up games is the ability to transform into a stronger form, the girls’ Shinobi forms are activated with the L button when the Ninja Art gauge is full. When they’re in this state, attacks are stronger and faster, combo potential increases, and you have the ability to pull off their Ninpon skills. The Ninpon skills are basically the trump card- they can lay enemies to waste with extreme prejudice. The catch is that the girls’ outfits have a durability meter below their health that represents how much is left of their outfits before they start breaking apart. Once they’re damaged to a certain degree, the character’s defense is lowered until they’re barely clothed, which leaves them a lot more vulnerable to getting dizzy or getting interrupted while attacking. As you level up each character, they acquire even more ninpon skills. For example, the ones you can do while in the air are, quite honestly, broken, being able to essentially wipe out even the toughest of foes with larger amount of health in one go, except bosses. What stems from the leveling mechanic is the Yin & Yang gauges which will also increase along with regular experience gained for leveling up at the end of missions. Unlike increasing a character’s level, Yang is increased by the usage of the Shinobi transformation, while Yin is increased by how often you use that character in Frantic Mode across missions.